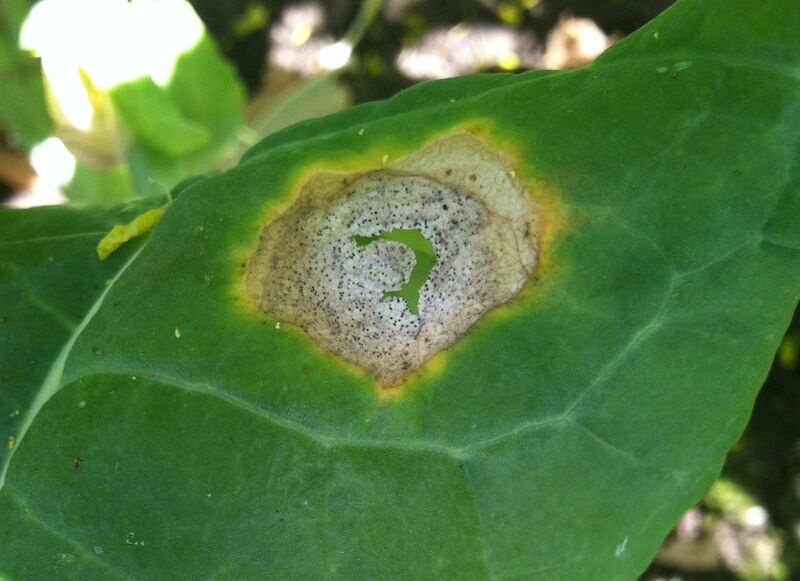 Close-up of a leaf spot caused by Phoma lingam on a Brassica leaf. Note the tiny black dots which are the pycnidia. Purple sprouting broccoli with a stem lesion due to black leg. Cause Leptosphaeria maculans (syn. Plenodomus lingam, anamorph: Phoma lingam) is a fungus that can infect a range of cruciferous crops including broccoli. Host plants include Brassica crops (Brussels sprouts, cabbage, cauliflower, collards, canola, kale, mizuna, mustard greens, rutabaga, turnip, etc. ), Sinapis (white and yellow mustard), and Raphanus (daikon and radish). Cruciferous weeds common in the Pacific Northwest can be host to black leg, including: birdsrape mustard (Brassica rapa), black mustard (B. nigra), western yellow cress or curvepod yellowcress (Rorippa curvisiliqua), tansymustard (Descurainia pinnata), hedge mustard (Sisymbrium officinale), tumble mustard (S. altissimum), small tumbleweed mustard (S. loeselii), pennycress (Thlaspi arvense), mouseear cress (Arabidopsis thaliana), annual wallrocket (Diplotaxis muralis), perennial wallrocket (D. tenuifolia), and wild radish (Raphanus raphanistrum). The fungus survives on living plants as pycnidia, which produce water-splashed pycnidiospores, or with plant debris as pycnidia and/or pseudothecia. Pseudothecia release ascospores that may be windborne long distances, at least several miles and perhaps further on storm fronts. The fungus survives with infected plant residues until the plant debris decomposes (up to 4 years). In fall-sown crops or winter weeds, new pseudothecia can form on dead portions of infected plants prior to plant death and pseudothecia continue forming on infected plant residues remaining on the soil surface after harvest. In spring-sown crops, pseudothecia do not form until after harvest, and their production on residues atop the soil typically starts the following fall after a couple of wet periods. Ascospores are released from the pseudothecia following wet or humid conditions and when mean temperatures are between 46°F and 59°F. Conditions conducive for ascospore production and release commonly occur during the fall, winter, and springtime throughout the Pacific Northwest. Trap plants deployed weekly in multiple sites around the Willamette Valley in western Oregon beginning in October 2014 and 2015, showed that the first ascospore infections occurred around mid-October. During 2015-2016, ascospore infections of trap plants occurred from mid-October into May with severe disease pressure during February and March. Wounding, insect injury, or herbicide injury can result in greater disease severity. Two types of pycnidia (which produce asexual spores known as pycnidiospores) can be found; one on infected, live plants (thinner-walled pycnidium with a neck) and the other on crop residues (thicker-walled pycnidium with a narrow ostiole). Pycnidiospores are dispersed by splashing rain or irrigation water, so pycnidiospore movement is limited to relatively short distances, but pycnidiospores can add to the overall incidence and severity of disease within a field. Workers or equipment moving through infected plantings during wet conditions can spread disease. Black leg can also move with infected seed, Leptosphaeria can survive for years in association with seed. But if, as a general practice, seed lots used for planting are Leptosphaeria-free then the spread of regional epidemics is thought to arise from infected plant debris. Even low levels of seed infection, when coupled with weather favorable for disease, can lead to severe losses, including stand die-out within a field. The Oregon Department of Agriculture requires that all crucifer seed, even half ounce or smaller packets, that is to be planted in Oregon must be accompanied by an official test showing that the untreated seed is free from black leg (Leptosphaeria species). This disease can reduce seed crop yields. After a disease outbreak in a larger geographic area, the threat of seed yield loss in fall-sown crops is much greater due to the abundance of affected crop residues on the soil surface, especially if field-wide epidemics occurred in no-till production. Widespread leaf spot and subsequent black leg stem cankers can result from unprotected plants being exposed to ascospores released from infected crop residues. Replanting or allowing volunteers to grow in a field after a black leg outbreak can result in high numbers of infected seedlings by fall in western Oregon or Washington Brassica seed fields, perpetuating disease. Planting adjacent to a previously-infected field can also result in a high disease incidence (40% to 60%) in the new planting by December, while planting within a few miles of an infected residue site can result in generalized infections across new fields (1% to 5%). Researchers at OSU have observed uncontrolled black leg infections in fall-planted seed fields in western Oregon to increase from a low disease incidence (1% to 5%) to high (40% to 90% of the stand infected) in a 6-week period. Infections of fall-planted vegetable or seed fields can lead to stand losses through winter into the spring. Symptoms Generalized leaf spots, becoming numerous across the field, have been observed in fall-planted crops after initial windblown spore (ascospore) infections. Pale, irregular spots develop on cotyledons, leaves, stems or petioles, later becoming somewhat circular to oval, ashy-gray colored with scattered tiny, black pycnidia. Sometimes the center of lesions will fall out, especially after heavy rain-fall, but a narrow, ashy-gray band with pycnidia usually remains. 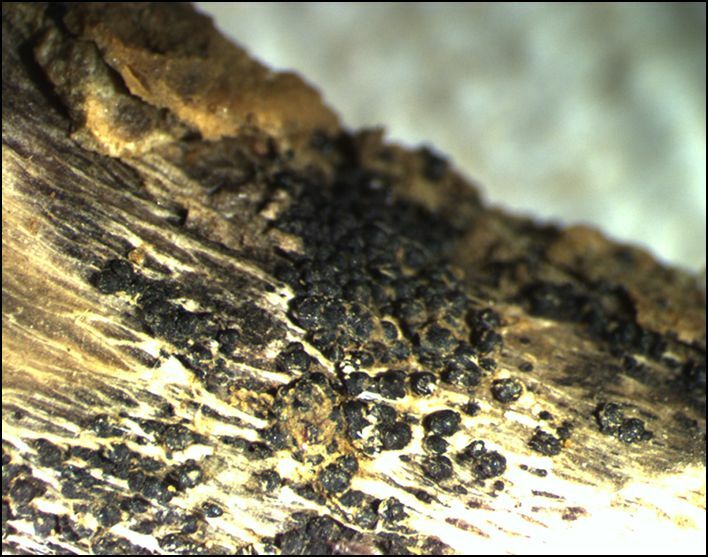 Stem lesions that develop after the fungus moves systemically are elongated with purple borders, often near the soil line, and may girdle the stem as well as decay pith tissues, and extend below the soil surface, causing a brown-to-gray to black rot in the lower stem and roots. Vascular tissues may turn black in color prior to exter-nal rot symptoms. Damping-off can occur if plants are infected at the seedling stage, usually through the use of infected seeds. Plants produced from infected seeds that survive the seedling stage are stunted and often develop a rot of the stem at or just below the soil line, which moves upwards and can cause plant death. In seed crops, leaf spots may appear on over-wintered leaves at initially low levels but increase as pycnidiospores spread the leaf spot. As seed plants mature, they may fall sideways from lack of root anchorage or stem cankers may cause the top of the plant to fall over. Symptoms on seed pods are rare and inconspicuous. 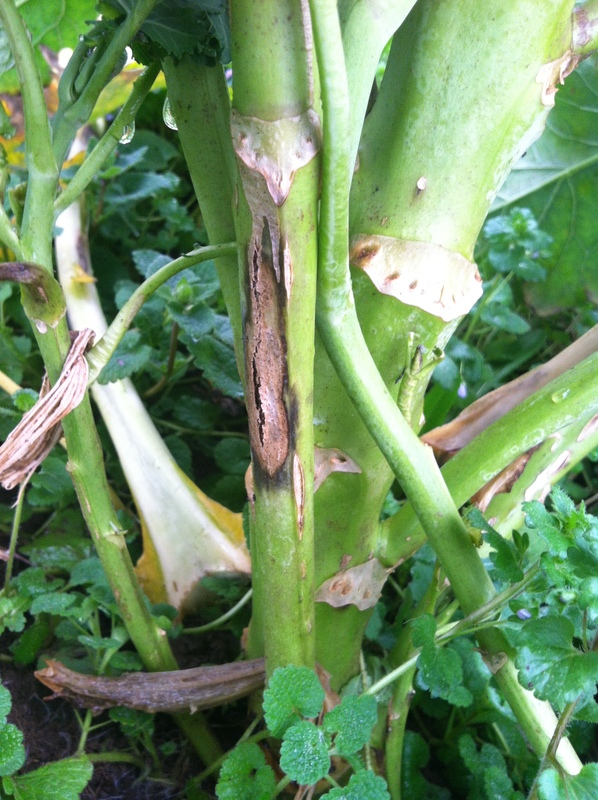 Black leg stem cankers in seed crops may be invaded by secondary pathogens, masking black leg symptoms on the stems of affected plants. Plant only seed certified by official testing to be free of Leptosphaeria. Avoid planting in or adjacent to a site where disease has occurred within the last 3 to 4 years; plantings within a quarter of a mile of a field containing black leg-infected crucifer residues are at high risk for developing black leg. Delay spring plantings until the weather is drier to avoid periods of ascospore release. Bury residues after harvest by deep plowing if possible, or remove plant debris. Multiple flailings (up to three) followed by a shallow incorporation may be sufficient depending on amount and size of plant debris as well as environmental conditions. Hot water seed treatment for 20 min. in water at 122°F (50°C). For organic production removal of affected leaves, shortly after leaf spots develop, can reduce secondary spread within a planting as well as the incidence of stem cankers. Chemical control Seed treatment and a foliar fungicide program will be essential if growing seed fields in any region where black leg epidemics have occurred across a larger geographic area. Infected seed can occur in seed lots, certified to be free of black leg, at levels below the detection threshold by seed testing, and chemical or hot water seed treatments will aid in controlling disease introduction by infected seed. Coronet fungicide seed treatment (Group 7 + 11) at 3.1 to 6.2 fl oz/100 lb seed (commercial seed treaters only) plus a dye. Studies conducted by OSU and WSU have shown Coronet at the higher rate to be a very effective treatment for seedborne Leptosphaeria and other fungi. Mertect 340-F (Group 1) at 3.5 fl oz in an equal amount of water (1:1)/100 lb of seed for seed production fields in Oregon (SLN No. OR-100014). Mertect at 0.002 mg a.i./seed is labeled for control of Fusarium diseases in broccoli and will aid in controlling seedborne Leptosphaeria. Studies conducted by OSU and WSU have shown Mertect to be an effective treatment for seedborne Leptosphaeria. Rovral 4F (Group 2) at 16 fl oz/100 lb seed as a slurry by commercial seed treaters only. Not to be used on farm. For seed production fields in Oregon (SLN OR-140013) and WA (SLN WA-070001). Studies conducted by WSU have shown Rovral to not be completely effective treatment for seedborne Leptosphaeria when used at 8 fl oz/100 lb seed. Cabrio EG (Group 11) at 12 to 16 oz/A, maximum of two (2) applications per crop. Do not make more than one (1) application of any Group 11 fungicide before alternating to a labeled fungicide with a different mode of action. Preharvest interval is 0 days. 12-hr reentry. Proline 480 SC (Group 3) at 5.7 fl oz/A for seed crops only in Oregon (SLN OR-150017) and Washington (SLN WA-160003). Do not windrow within 14 days of last application. Preharvest interval is 14 days. 12-hr reentry. Quadris Top (Group 11 + 3) at 12 to 14 fl oz /acre is labeled for other fungal diseases on leafy Brassicas and will help control Leptosphaeria. Do not make more than one (1) application of any Group 11 fungicide before alternating to a labeled fungicide with a different mode of action. 12-hr reentry. Rovral 4F (Group 2) at 2 pints/A, maximum of two (2) applications per crop starting at the 2- to 4-leaf stage as a directed spray at the base of plants; can be reapplied up to the day of harvest. In seed crops in Oregon (SLN OR-130001) and Washington (SLN WA-960027) only, Rovral 4F at 2 to 4 pints/A can be applied for other diseases up to three times; at full bloom, pod set, and just prior to harvest and will aid in controlling Leptosphaeria. 24-hr reentry.